The Glasgow Defence Campaign and the Free Hetherington Occupation jointly called a protest on Saturday 16 April to challenge the ongoing campaign of intimidation and harassment organised by Strathclyde police. If the cops thought their nicey, nicey, hands-off approach on the day of the protest would undermine the campaigner's defiance and quieten things down they must have spluttered over their station tea as the issue got front page and a full page inside the widely read Glasgow Evening Times. Now tens of thousands know about Strathclyde's finest's recent behaviour. According to the cops, to oppose the massive tax dodging scams of the super rich is a crime that justifies tailing and jailing teenagers. In the week before the protest, anti- cuts activists of the ages of 14 and 17 had their homes visited by plain clothes dicks and charges were brought arising from peaceful sit- in protests staged against the Vodafone multinational in December of last year. 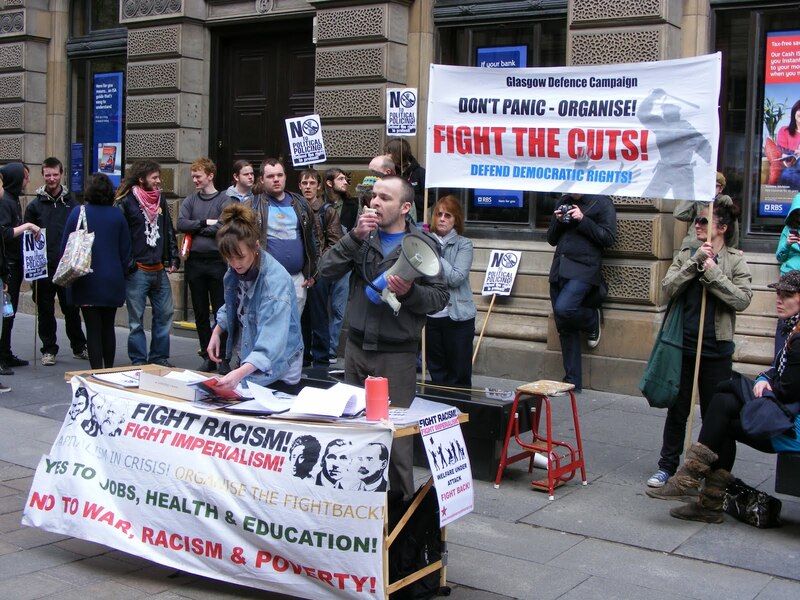 Outrageous bail conditions prevent those charged from entering Glasgow city centre and ban them from joining a public assembly of two or more people. They could not listen to messages of solidarity from journalist John Pilger, comedian Mark Thomas and former Black Panther Emory Douglas. Speakers from Fight Racism! Fight Imperialism!, the Bryan Simpson Defence Campaign and UK Uncut used the open mic to expose and condemn the tactics of the cops against the emerging anti-cuts movement. Comrades and Scottish parliamentary candidates from the Scottish Socialist Party and Solidarity were amongst more than 60 of us calling for opposition to police repression. 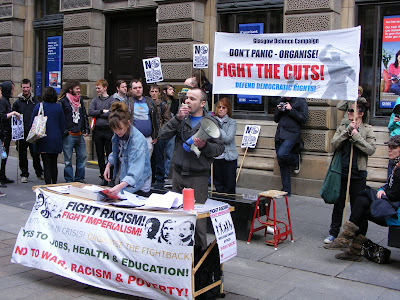 The protest was kept up to date with the progress of an occupation of a bank- the Royal Bank of Scotland- taking place immediately behind them as speakers condemned the ConDem government's cuts. Campaigners against the closure of an Adult Day Centre brought the fiddle that the ruling class and its media are trying to pull into sharp focus- rich, white men were telling us that vital facilities like Day Centres had to close so that banks could balance their books. The Accord Centre folk had recently made the headlines by chasing the Scottish Labour leader, Ian Gray, out of nearby Central Station as he tried to avoid supporting their fight. The message of the protest was that we are not going to avoid any fight against any cuts despite police attempts to silence us and break up campaigns and activist's organisations. The campaign to fight the cuts was only at the beginning and many battles lie ahead. The police were openly warned that their behaviour would only make the fighters more organised and more determined! The Glasgow Defence Campaign salutes the unity that is being built in defence of democratic rights – unity in the face of police repression which will only become more urgent in the coming period. "No human being on the face of this earth, no government is going to take away my right to speak, my right to protest against wrong, my right to do everything that is for the benefit of mankind. I am not here, then, as the accused; I am here as the accuser of Capitalism dripping with blood from head to foot." No Cuts - Full Stop!